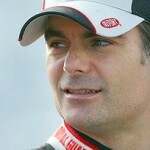 September 20 – – A 15th place effort was not the way that Jeff Gordon wanted to begin the Chase for the Championship. 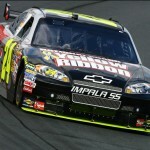 He’ll have to climb out of a 100+ point deficit due to the substandard finish at New Hampshire Motor Speedway. Gordon started 10th and moved to 7th on lap 3 by using the outside line. He took the 6th position from Martin Truex Jr on lap 10, and moved into the top-5 on lap 14. 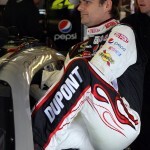 Gordon patiently worked through lapped traffic and took 4th from Denny Hamlin on lap 52. 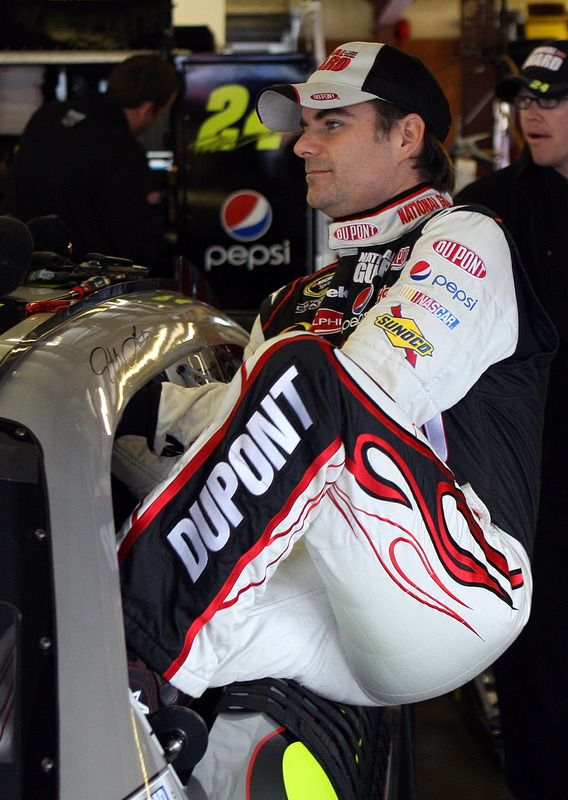 Twelve laps later, he dove to the inside of Kurt Busch on the backstretch and moved to 3rd. The first caution waved on lap 66 for Kasey Kahne’s blown engine. Pit stops ensued with Gordon departing pit road in 5th position after overshooting his stall coming in. 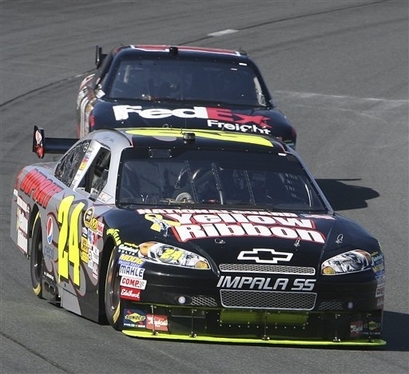 On the restart, Gordon dropped to 7th as the outside line had the momentum, and Jimmie Johnson zoomed past on the inside. 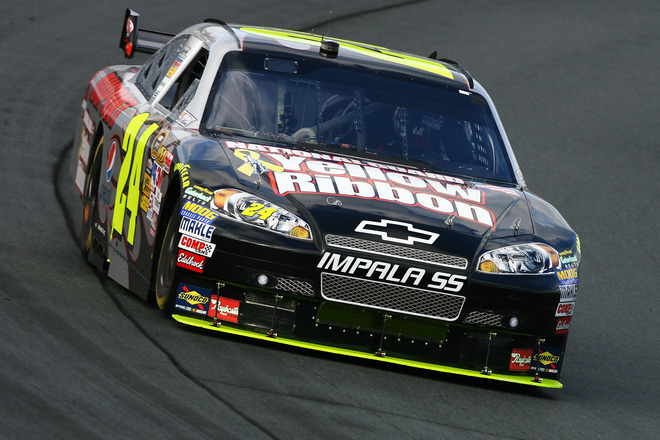 Gordon held 7th as the air pressures stabilized, before a debris caution on lap 85. The leaders elected to stay on the track. Gordon faded to 12th within two laps of the restart. On lap 115, he took 11th from Brian Vickers, and re-entered the top-10 on lap 119. Gordon moved up to 9th on lap 125 from Ryan Newman. A debris caution brought the leaders to pit road on lap 135, with Gordon departing in the 8th position. He held 8th on the restart and ran there for 20 laps before Erik Darnell brought out the caution. Gordon opted for fuel only and was the 2nd car off of pit road. He restarted in 9th due to drivers staying on the track. A multi-car incident on lap 169 collected Paul Menard, Elliott Sadler, Michael Waltrip, John Andretti, and Robby Gordon. 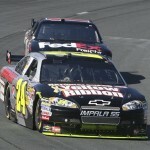 Gordon restarted 10th and moved to 9th before Jeff Burton’s spin on lap 176. David Stremme’s wall contact brought the caution and the leaders to pit road with just over 100 laps to go. Gordon opted for right side tires and restarted in 14th place. He struggled with the handling and opted for wholesale changed during the next pit stop on lap 250. He dropped to 18th before a debris caution with 23 laps to go. Gordon opted to come to pit road for fresh tires in the hopes of making a final charge. Gordon restarted 19th with 18 laps to go. He moved up to 15th at the finish. At the front of the field, points leader Mark Martin held off Denny Hamlin and Juan Pablo Montoya to win his 5th race of the season.